4287 Santa claws Minifigure Snow Globe is a Seasonal snow globe released in the year 2005. The snow globe features a base with designs of candy canes, wood, and a festive door carved into it. The globe itself contains a Santa Claus minifigure, and a rare snow-covered tree, as well as a profusion of snow material. 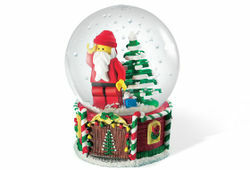 It is the same set as 4287988 Santa Mini-Figure Snow Globe. Facts about "4287 Santa Minifigure Snow Globe"
This page was last edited on 29 April 2016, at 16:55.